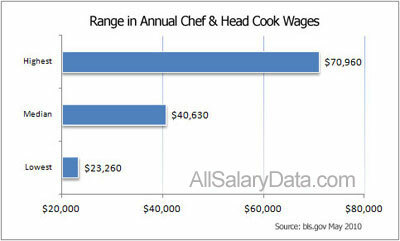 What is the average salary for Chef? Chefs direct cooks within the kitchen of a restaurant or other food service establishment, handle food-related issues, and provide leadership to the food service staff. Chefs and head cooks are usually the most skilled cooks within a kitchen and apply their knowledge of food and creativity to create and prepare recipes. Ensure an efficient and profitable operation of the food service establishment. Mean annual wages for the 90,510 chefs employed in the U.S. in May 2018 was $44,780, reported by the Bureau of Labor Statistics. Top ten percent were paid an average of $70,960 annually. Full-service restaurants offered the highest levels of employment. Other industries with high employment levels included traveler accommodation, special food services, amusement and recreation industries other than amusement parks, and limited service eating places. With an annual mean wage of $61,960, New Jersey was the highest paying state for chefs in May 2018. Connecticut, Rhode Island, Delaware, and California were also top payers, offering an annual mean exceeding $48,500. The lowest paying states provided an annual mean wage of $30,420 to $36,710 and included Georgia, Tennessee, Oklahoma, Idaho, North Dakota, and South Dakota. Though employment growth in this field is expected to be slower than average, with no real increase between 2008 and 2018, job opportunities are anticipated to be good. This is because a large number of workers leaving this career must be replaced and population increases will require additional food service establishments. At the same time, competition will be keen for positions in upscale restaurants that usually offer higher wages. As of 2018, California, Florida, Texas, Illinois, and New York employed the most chefs, according to the Bureau of Labor Statistics. Most chefs have undergone some postsecondary training but experienced individuals with less education may be promoted to this level. 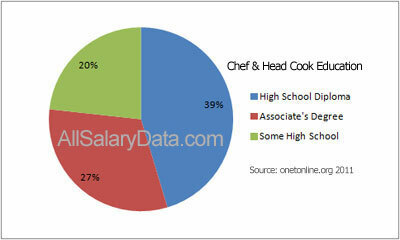 In fact, 20% of chefs responding to an O*Net career survey had less education than a high school diploma. A high school diploma or equivalent was held by 39 percent and 27 percent had an associate’s degree. Technical schools, community colleges, culinary arts schools, and two or four-year colleges offering hospitality degrees may provide formal training. An increasing number of chefs are electing to participate in training programs offered by professional culinary institutes, independent cooking schools, colleges with a culinary arts or hospitality department, or the armed forces. Some large restaurants and hotels offer chef training and job placement. The primary component of culinary training involves practicing cooking skills in kitchens. Knife techniques, classes in menu planning, nutrition, portion control, food storage procedures, inventory and purchasing, food service management, and waste minimization are also included. Students are usually also required to perform an internship or apprenticeship in a commercial kitchen. Over 200 formal chef education programs are accredited by the American Culinary Federation, which also sponsors apprenticeship programs. Some chefs learn on the job by training with chef mentors or entering formal apprenticeship programs such as those sponsored by the U.S. Department of Labor. Personal chefs, pastry chefs, culinary educators, and different levels of chefs are certified by the American Culinary Federation. Formal training and experience form the basis of certification standards. This certification is not required but may result in higher-paying employment. Cooks and food preparation workers also prepare, season, and cook food items, working in hospitals, schools, grocery stores, restaurants, and other food service establishments under the supervision of chefs. Cooks measure, mix, and cook food ingredients according to recipes, while food preparation workers perform more repetitive and routine tasks like preparing salads, cutting, slicing, and measuring. Food service managers are employed by the food service industry and work closely with chefs. They oversee the daily operation of restaurants and other food and beverage service establishments. Customer satisfaction is their goal when they coordinate dining room, banquet, and kitchen operations.